It’s time for another bread but this time the bread has taken a different shape! The word ‘bread’ typically brings to mind a typical loaf, ready to be sliced and slathered with butter or jam. The world would be such a boring place if people didn’t go beyond a loaf isn’t it? Thank God for people who thought out of the box and tried their hand at making something different like these breadsticks for example. Early this month I joined a new baking group called the ‘Bread Bakers‘ hosted by Stacy Livingston Rushton of Food Lust People Love. 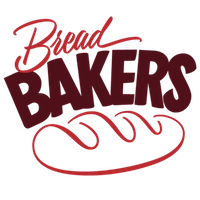 Bread Bakers is a delightful little group of enthusiastic bakers who bake a new bread based on a theme every month. Do read more about this group at the end of this post. This month’s theme ‘Seeds’ is selected by Karen of Karen’s Kitchen Stories and I chose to work with sesame. The flexibility that we are given to select a bread helped me go on a joyride of recipe hunting and Oh boy! did I have fun! I came across so many different types of bread that I had a tough time selecting one. 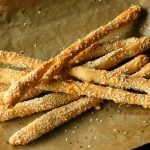 I thought these breadsticks were pretty interesting as they were not only fun to make but were also thoroughly enjoyed by my kids. Not just that, the Grissini has an interesting history behind it. While it can be traced back to the Piedmont region of Italy there are two versions to its origin. As per oral tradition, in the year 1675, the young duke of the House of Savoy, Vittorio Amedeo II di Savoia who was nine years old was seriously ill. Since he was a frail child since birth and having suffered from intestinal disorders he was particularly unable to digest heavy food and so his mother asked the court physician to find a remedy to feed her son. The physician fell back on his own experiences with intestinal disorders which was set right by his mother’s bread which was a well leavened and crisp bread (a crisp bread with little crumb ensured that food poisoning from pathogenic intestine germs present in regular bread as ruled out). The bread was recreated by him and the little duke recovered and went on to become the first Piedmont king in 1713. The crisp grissino continued to be the bread of preference by the whole Savoia household and soon enough became popular among the commoners as well. However, historic records also show presence of this bread much before this duke took his first bite of the grissini. It is believed to have been created by a Florentine abbot in 1643 in Turin that was supposed to be ‘as long as an arm and as thin as dead bones’. The true story of its origin is something we will never know but what we do know is that today it is enjoyed across the world as a snack or an accompaniment to soup. I made them in two batches, one with a little grated cheddar coating along with the sesame and another with just sesame – both of them tasted marvellous and were finished off mostly by my son with a few nibbles spared for me. 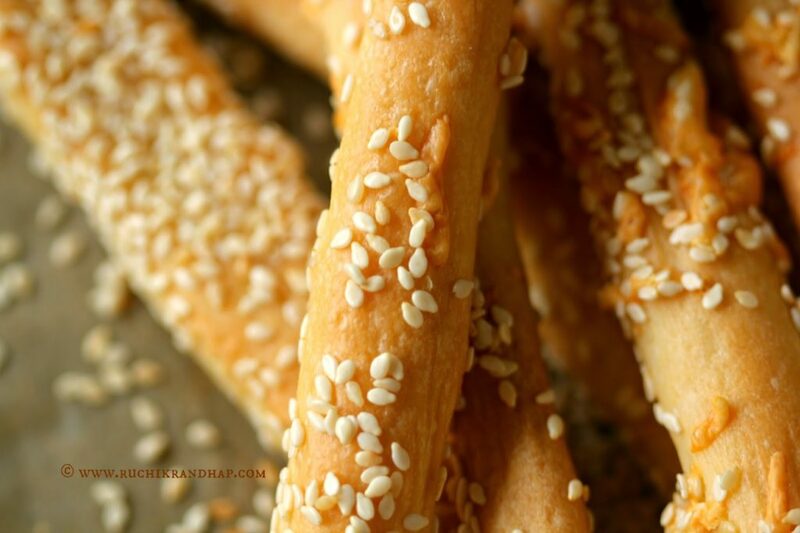 The toasted sesame that fell off the grissini is what I still enjoy munching on – that tastes delicious as well. This is something for you to try on a boring afternoon to help perk your mood! Click this image to save this recipe on Pinterest! In a bowl mix 4 tablespoons of lukewarm water (out of the 2/3rd cup) and the instant yeast and sugar. Keep aside for 10-12 mins until the mixture turns frothy. If it hasn't then discard and start all over again with a new package. Meanwhile sift the flour and salt into a large bowl and make a well in the centre. Add the frothy yeast mixture and olive oil and mix. Add the rest of the lukewarm water in parts and keep kneading until you get a smooth dough. Turn it onto a lightly floured surface and continue to knead for 8-10 mins till smooth & elastic. Now, roll the dough into a 6x8" rectangle, brush with olive oil and cover with a plastic film/cling wrap and leave in a warm place until it doubles in volume. When the dough has doubled preheat the oven to 200 C. Line two baking sheets/trays with baking parchment (butter paper) or lightly oil the trays. Cut the dough into two equal parts (3x4" rectangles) and then each rectangle into 10 strips of approx 3" each. Stretch each strip gently until it is 12" long. Place the grissini, spaced well apart on the prepared baking trays and bake for 15-20 mins until golden - keep an eye out as they brown quickly after 14-15 mins. Remove and cool completely on a wire rack. Karen’s Kitchen Stories. Follow our Pinterest board right here. Links are also updated each month on this home page. We take turns hosting each month and choosing the theme/ingredient. If you are a food blogger and would like to join us, just send Stacy an email with your blog URL to foodlustpeoplelove@gmail.com. I'm so glad you have joined us, Shireen! I loved reading about the possible histories of grissini and I'd like to go with the dried bones version. 🙂 Because it's more gruesome and fun. In a weird sort of way. Meanwhile, your sesame grissini look fabulously crispy and more-ish. Shame you've eaten them all or I'd be right round. 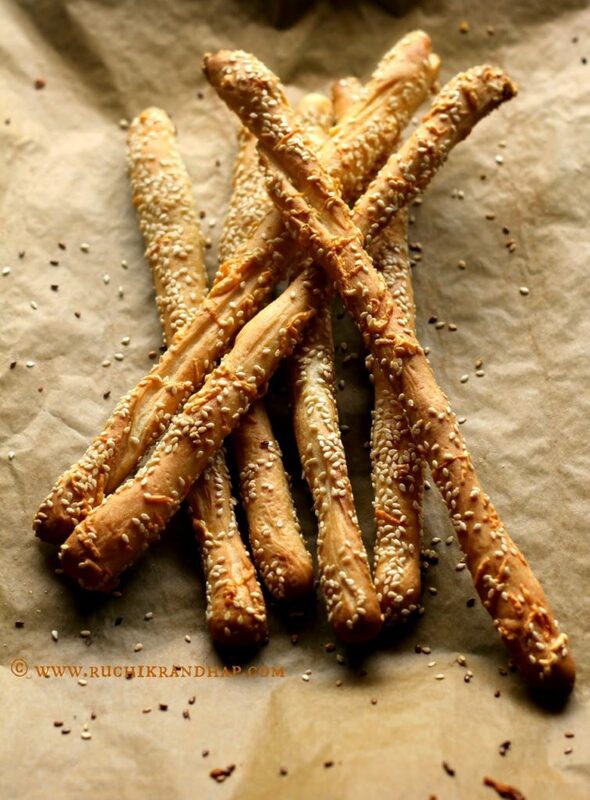 I've made pretzel sticks before but not bread sticks. I love that delicious crunch and really like the idea to add cheese to a few! Love the bit of history you shared; I hope that bread is the medicine that can cure any of my ailments too! I am going to make these with my kids too, I think they would really enjoy the process and the final product as well. Oh my this would be perfect dipped in some marinara. I could just eat these sticks for dinner. Hi Shireen, your breadsticks are lovely. I am definitely putting these on my to make list. Welcome to Bread Baker's, Shireen and what a wonderful first post. I didn't know that breadsticks had so much history. They look wonderful and ready for a cup of soup. WOW Shireen…way to go my girl!!! You are enjoying your baking and I am enjoying the pictures and the narration. I have to give this recipe a try. Keep up the good work. 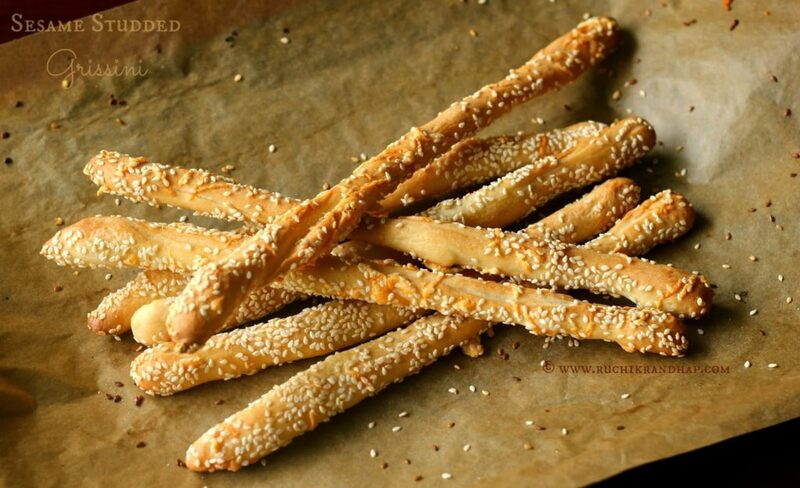 Your grissini looks absolutely perfect! Fabulous choice for seeds! 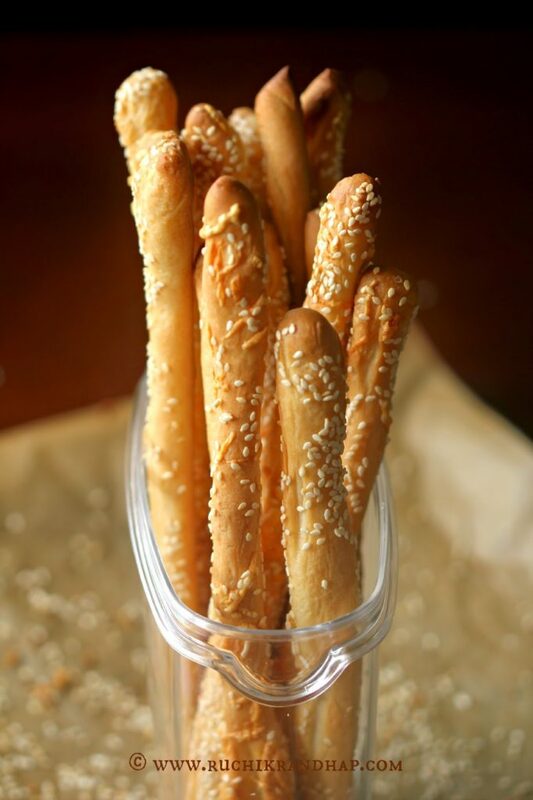 These sesame breadsticks look delicious! Welcome to the group, Shireen! Your grissini looks wonderful. I'll be sure to make this the next time I'm making bread sticks for friends. @ Stacy: Thanks so much for your lovely words! Yeah, the dried bones version sounds more interesting isn't it? 🙂 I am so glad to be a part of your lovely group! @Holly: Thanks! The kids will love it for sure! @Wendy: Thanks so much! Do give them a try! @ Ansh: Thanks so much for the warm welcome and thanks again for introducing me to this lovely group! You must make these! @ Cyn: Thanks a ton darling! Do give these breadsticks a try! @ Karen: Thanks a ton!! Hope you give it a try soon! @ Heather: Thanks so much! @Vimala:Yes, please give them a try, they are delicious! @Kelster: Thanks so much for the warm welcome! Do give these breadsticks a try!